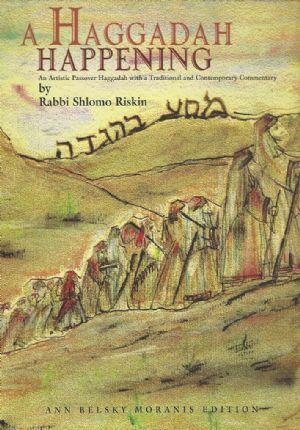 Rabbi Shlomo Riskin’s artistic Passover Haggadah with a traditional and contemporary commentary will make your Seder night different from all other Seder nights. Illustrated by students of the Ann Belsky Moranis School of Art, A Haggadah Happening analyzes some of the fundamental themes of Jewish spirituality, drawing conclusions on the religious significance of Passover as both a re-enactment of the Jewish past and a window to the Jewish future. The Art School students’ artwork reflects and enhances the text and commentary of the Haggadah. As part of the Haggadah Happening seminar, the students explored Jerusalem with cameras, investigated ceremonial objects and illumniated manuscripts, studied Gemara and Midrash, met with artists and scribes, learned sketching, calligraphy and computer art. The results of these experiences are reflected in the striking, full-color illustrations. What the students learned about art, about Pesach, about the Haggadah and about themselves finds expression in the artwork.